Uber’s self-driving truck emerged from its 2016 acquisition of Otto, an autonomous trucking start-up founded by a former Google engineer. The acquisition was at the heart of an intellectual property lawsuit against Uber that was brought by Waymo, the self-driving car unit from Google’s parent company, Alphabet. The two sides settled the case last month. While that legal case dragged out, the company continued to refine its driverless truck technology to find its place in an increasingly crowded field. Waymo has also said it is considering using its driverless car technology for trucks, while Tesla said it plans to introduce an electric truck with a self-driving mode built in. Trucking is a natural target for automation. In theory, automated trucks can stay on the road longer than those with human drivers and, over time, are expected to be less prone to accidents because they don’t get sleepy or distracted. Eventually, these factors are expected to make self-driving trucks a cheaper alternative. 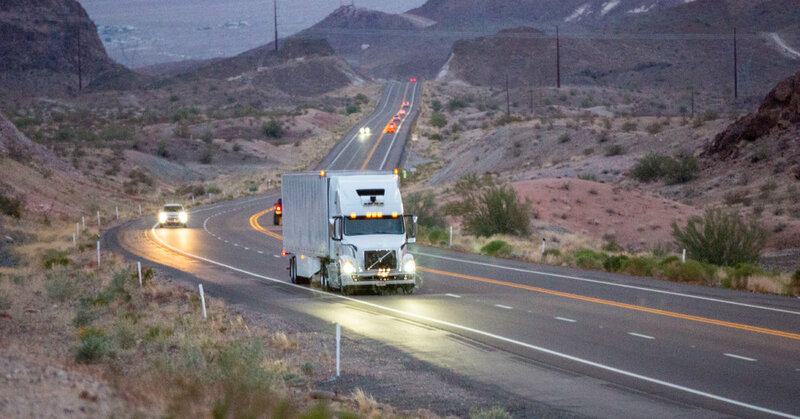 “We think self-driving technology has tremendous potential to solve some of the big problems that the trucking industry has today,” said Alden Woodrow, the product manager for Uber’s self-driving truck unit. Uber launched Uber Freight, an app that matches truckers and trucking companies with loads to haul, in May 2017. In a business model that is similar to its ride-hailing service, Uber doesn’t actually handle the deliveries but works behind the scenes to create a marketplace for truckers and shippers. The company said it was working out of two primary transfer hubs in Arizona — one in Sanders near the border with New Mexico and another in Topock near the California border. Uber isn’t saying much about its self-driving trucks. It won’t disclose how many trucks it is using, how many miles they’ve driven or how often the human safety drivers had to intervene and assist the autonomous system. It is also not revealing many details about how the transfer hubs would work — including what they would look like, where they would be located and how the company planned to roll them out. When it comes to the politically sensitive question of whether Uber’s technology will eventually eliminate trucking jobs, the company walks a fine line. For now, Uber said it believed the introduction of self-driving trucks would bring about more driving jobs, not fewer, in part because of greater demand as delivery costs fall. However, the nature of a trucker’s job may change — becoming something akin to a parcel delivery driver, shuttling trailers between the hub and local destinations. While autonomous systems may one day be able to do everything a human truck driver does, Uber said it was not training its trucks to do it all, like back up to a loading dock or navigate around a busy industrial area.